I was so surprised. And SO excited! I love the first two books, and knew that requesting the book on NetGalley couldn't hurt. So, starting this book you jump into the middle of the school year and Saphronia and the girls dealing with the repercussions of some things that happened in previous books. But they don't stay at the school for too long, however. Saphronia's older brother is getting married so the girls are off to a ball in celebration of his engagement. The majority of this book does take place away from the school, which was fine. But I do so enjoy their shenanigans on the ship. I also understand how it would be a little too... redundant to have them on the dirigible again, and this story definitely needed to be told away from the school. We also see some things happening that tie in to the Parasol Protectorate series - and if you've read them you'll know instantly whats going on. If you haven't, you'll be just fine reading it - there won't be any confusion, just a it of mystery. Along the way of these events, the girls stumble upon a more sinister plot. While helping Sidheag, Saphronia can't help but follow up on her curiosity and suspicions. We do, of course, have both Soap and Lord Mersey vying for Saphronia's affection. I personally, love Felix. I really just can't get enough of him, of his character. I like Soap just fine as a character, but for whatever reason I just don't feel any real chemistry between the two of them, and I just can't see them as a good pairing. As much as I usually hate love triangles, Ms. Carriger does write this one pretty well. It doesn't leave me feeling annoyed and infuriated, and while Saphronia does dwell over the two boys quite a lot during this book... it never felt like it was detracting from the story to me. That being said, events take place. There were some great moments, some surprises, and some really fantastic flirtations. So yes. This book was ABSOLUTELY wonderful to read. I loved it. I had so much fun reading it, and was most definitely not disappointed! I cannot wait for the next book, but I also don't ever want this series to end! Its just so much fun! But on one last note: I most definitely did miss Vive in this book. Sorry to say she doesn't make an appearance, though thats not much of a surprise since book 2 ends with her going off to Bunson's school for evil geniuses. 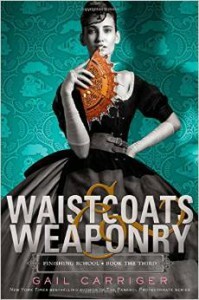 Anyways, a must read for fans of Gail Carriger's work.